these are just wow 🙂 ! I’m glad you think so, Wolfgang, thank you! Simply stunning and inspirational as always. Love your work. Thanks very much, A_Wally, I appreciate it! It’s hard to keep up with things they go by so fast! Thanks very much. like a movie still…but also as if you can hear some kind of sound while looking at it. The colours in the second one are so beautifully full. This is strong. I really like these ‘slipping by landscapes’ Karen! I like that you hear sound when you look at these. Thanks for your thoughtful and encouraging words, Belinda. I’m really enjoying working on this series and I’m delighted that you find these images strong. Slipping by is a perfect description! The color and composition, better than perfect. I appreciate your lovely comment, Elena. : ) Thanks very much, I’m loving exploring this technique and series. Sketching/painting with a camera – endless fun! Thank you ,Marina, I am grateful for your always kind encouragement. Wonderful motion and the color schemes are perfect. Thank you, Mary, I’m happy you like these! It makes me want to take train rides and car trips just so I can play with this technique. Thanks so much, Stéphane. Yes, I enjoy trying to make painterly photographs, I’m glad you like them! Very ethereal in their beauty. So beautiful. Such a nice comment, Wood Dragon, thanks very much. 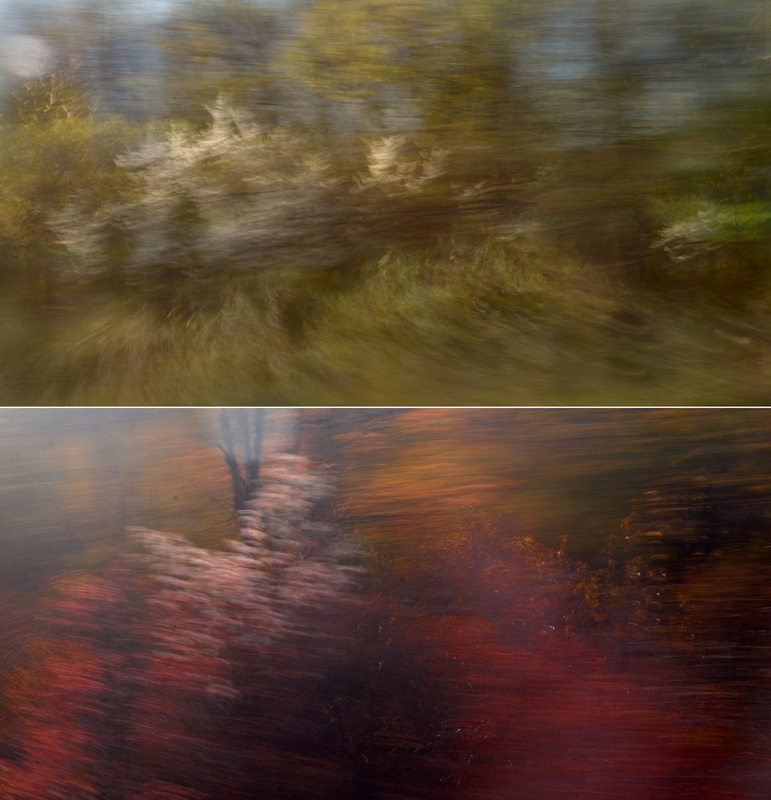 I’m looking forward to trying to make more as the seasons and landscape change. I sigh. Such beauty on this otherwise ho-hum morning. Aw, thanks very much, Jen. I hope your day became more exciting! These pictures bring the autumn mood. Nicely done! There is a bit of autumn in the air for sure, and I’ve seen some changes in the color of leaves. It’s not far off! Thank you, Alexander. Yay, thanks so much, Robyn! I really like the contrasting, yet complimentary colors of these two shots. Incredible ~ and they look so good together. I’m loving this exploration with photography so I’m glad you like them, Randall. Thanks very much for your comments. Gorgeous, breathless rushes of colour. Fantastic shots! I love your rush of words, too. Thank you so much, Richard, I’m happy you like them. Love the complement of colors as they rush by. Captivating, Karen. Thank you. Thanks very much, Elin, that’s kind of you! Fantastic, the second a true rush of blood to the head! Racing beauty..
Beautiful energy in these images. It’s like a wind of colours taking us to a different place. Together they create a mood of fast pace and complementary vividness that is impossible to resist. That’s a really great comment, Otto, thank you! Ohhh… intense. Especially the second one – stunning balance of hues. Thank you Alessandro. Sometimes I find it difficult to work with a lot of (intense) colour but these worked for me somehow. How are these done? They are incredibly beautiful! They were made while traveling in a moving vehicle – in this particular case a train. I pan my camera after I pick a subject and experiment with exposure length and whatnot. The whirling often surprises me. Thanks very much, Steven! I am breathless again. It’s a new style of photography. The original, mysterious and extremely attractive. An unusual, yet quite simple story compressed into a short (or long – depending on how long you observe it) film – actually only a single frame. Poetry capturing the intangibility of time. The relativity of space. And their fascinating swirling transformation. For me, it’s like a miracle. Jan, I am thrilled you feel so much when looking at these. Thank you so much for taking the time to leave such a beautiful comment, I am truly honoured and touched. wow.. that is really amazing, I love the colours! Your work never fails to delight the eye and the mind. What a kind and thoughtful comment, I’m so thrilled you feel that way. Thank you, Mary.